Are you looking for ways to save at the New England Aquarium in Boston? The New England Aquarium is located at 1 Central Wharf in Boston and is a fun visit with kids of all ages! Admission to the New England Aquarium is $27.95 for adults, $18.95 for children 3-11, and $25.95 for seniors 60+. Children and museum members are free. Receive free admission from September to June (up to 4 people) through the Boston Public Library with advanced reservation. Many other local libraries offer $10 passes, up to 4 people. Admission Included for visitors with the Go Boston Card + skip the line perk! Admission Included for visitors with Boston CityPass + skip the line perk! The best money saving option to the New England Aquarium is the Boston Library pass! You can’t beat FOUR FREE admission tickets! Keep in mind that any Massachusetts resident can become a Boston Library cardholder (and some other people may also qualify), so you don’t have to be a Boston resident to take advantage of this offer! However, because this is such an awesome deal, the library passes are quite popular, so you really need to reserve a few weeks out if you are interested. A lot of libraries in the Greater Boston area also offer $10 passes, which is a great alternative if you can’t get a free pass from the BPL. The library coupon is not available in July and August, however, so you will have to use a different offer in the summer. If you are visiting Boston, you may want to purchase a Go Boston Card of Boston CityPass because admission is included and you can skip the line, which is a huge perk if you are visiting during peak times or are short on time. You can also skip the line if you are buying IMAX tickets or buy your tickets in advance online, although there’s no discount for buying online– just the skip the line perk. However, I went on a weekday in April (no school day, though) and the line was REALLY long. The skip the line perk can be a great savings when you are shorter on time than money. Also, keep an eye out for more discounts that I may have missed (let me know in the comments!) because my cashier put my library coupon on top of a pile of coupons, and there was one I didn’t recognize. I didn’t want to be creepy and ask, but it looked like it came from a tourist stand or book– so keep an eye out for additional coupons around the city I may have missed. I usually never see daily deals for the New England Aquarium at Groupon or through other sites, but it doesn’t hurt to look, especially in the winter months. Sometimes Goldstar Boston will have discount tickets for Whale Watching out of the Aquarium, so you may want to check Goldstar if you are interested in a whale watch as well. The New England Aquarium is located at 1 Central Wharf in Boston near long wharf and Faneuil Hall Marketplace. There is also an Aquarium T stop on the MBTA Blue Line and it’s a quick walk to the New England Aquarium as well as an 8-15 minute walk from other subway stops/lines. The least expensive ways to get to the New England Aquarium is to walk or take the train. The NE Aquarium does not have their own parking garage but there are area parking garages, but they can be expensive, especially on weekdays. 75 State Street: $42 for parking longer than an hour, $18 for weekdays after 5pm and weekends, $39 with validation on weekdays and $15 with validation on weekends. Buy ahead of time online for $35 for weekday parking. I’m a big fan of smartphone parking apps because you can see what parking garages are available at the current price. Often times you receive a small discount for booking through the app as well. If you don’t want to drive, walk, or take the train, you can also take the ferry to the New England Aquarium. You can take a boat from Hingham, Hull, or Logan Airport. Fares vary, but is generally $9.25 per ride. Children under 11 can ride free and students and seniors can receive half off rides. For more information about taking the ferry to the New England Aquarium, please head here. The New England is a fun place to visit, especially for kids! It can be quite busy, so plan to visit on a weekday or early or late in the evening if you dislike crowds. For more information about the New England Aquarium, please head here. 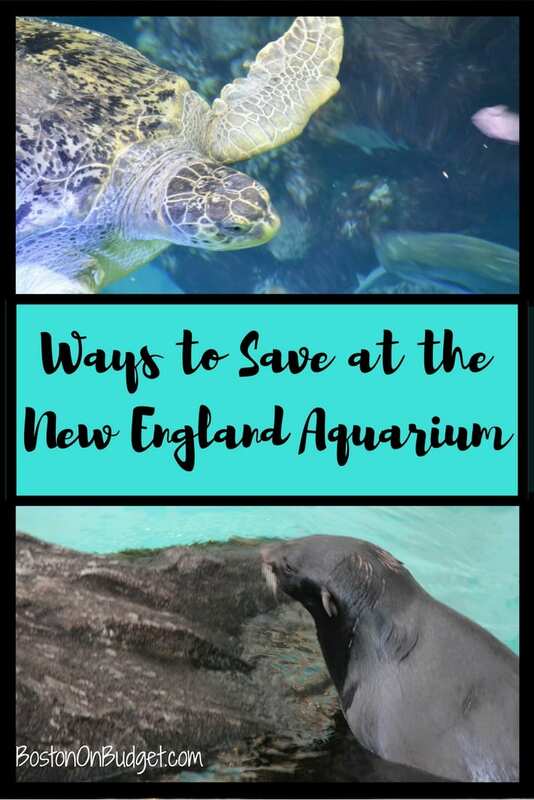 Do you have any money saving tips to share for the New England Aquarium?